This essay takes a narrow view of the debate; does the central bank set the level of the “money supply” or an interest rate? However, some authors take a wider definition of what constitutes the “endogenous money debate,” but I view those to be separate questions. These wider definitions are more relevant to understanding recent macro arguments, as it would be difficult to find a trained economist under the age of 40 who follows the strict definition of exogenous money that I use. These more general definitions are more abstract, relying on unmeasurable concepts like the expected money supply. Since the assertions in those debates cannot be compared to empirical results, there is no way of resolving them one way or another. This an old debate (described further below), the exact terms of debate have changed over time. Since I believe that the debate is over, I will not worry about the exact phrasings used historically, and offer a simplified explanation. Neither step in that story [exogenous monetary base and a money multiplier] represents an accurate description of the relationship between money and monetary policy in the modern economy. Central banks do not typically choose a quantity of reserves to bring about the desired short-term interest rate. Rather, they focus on prices — setting interest rates [emphasis in original – BR]. If we follow my prescription of abolishing “money” from economic theory, the debate is even easier to deal with. Instead of discussing whether the central bank can set some nebulously-defined “money supply,” we have to ask ourselves: can the central bank set the level of various instruments? There is no mechanism for the central bank to set the level of currency in circulation. It cannot force people to withdraw currency from banks. It could attempt to stop people from doing so (by stopping the delivery of new currency to banks), but this would trigger something resembling a bank run, and so the financial stability mandate of central banks would prevent that action. The situation regarding reserve balances can be complicated by the reality that the central bank operates by buying and selling assets (or using loans) to hit its interest rate target. The argument here is that the central bank uses the price signal of the interbank interest rate to guide its actions, and does not really care about the magnitude of the operations. This is illustrated in the figure below, which depicts the behaviour of reserve balances during 1959-2000 (which is before the Federal Reserve lost its marbles and instituted Quantitative Easing). The top panel shows the level of excess reserves in the United States banking system during that era. Up until the mid-1980s, it was well below $1 billion. Although $1 billion was a lot of money for an individual in those days, that is minuscule relative to required reserves. 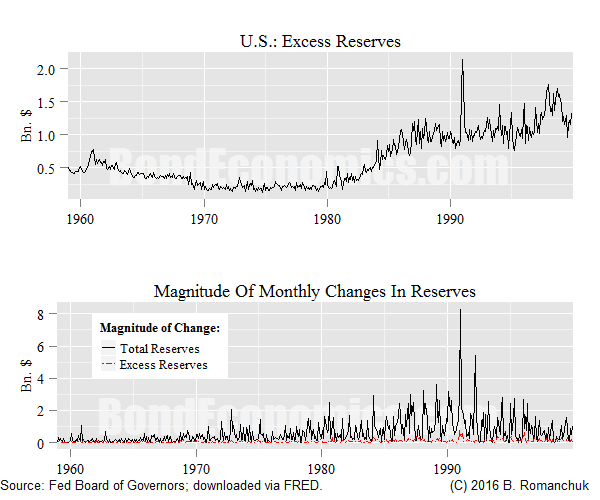 The bottom panel shows the magnitude (that is, absolute value) of monthly changes in total reserves as well as the changes in required reserves. The monthly changes in total reserves dwarfed that of excess reserves. Since excess reserves were essentially a small constant amount, the Federal Reserve had no choice but to supply almost exactly the amount of reserves required by the banking system each month. Notably, this was also true for the early 1980s, which was when the Federal Reserve was allegedly targeting the money supply (see below). In summary, the policy-making committee at the central bank sets a target level (range) for the interbank rate, and the open market desk injects/drains reserves until the market rate of interest hits the target level (range). (Historically, the Federal Reserve allowed for a relatively wide variation around the target rate; once banks grew accustomed to the framework of an explicitly announced policy rate, the market rate was very tightly tied to the target.) The open market desk had very little leeway in setting the magnitude of the operations, since they had to provide enough reserves to cover required reserves, plus the small excess. One could try to claim that the money supply is influenced by central bank policy; but the same thing is allegedly true of the price level when the bank targets inflation. Nobody sensible believes that the central bank has the power to set the price level in the economy to whatever level it wishes each month  (which is what a belief in an exogenous price level/inflation rate implies). Ricardo and the Currency School argued that only coins and Bank of England notes could be considered as money, that this stock of money determines aggregate demand, and that aggregate money determined the price level, thus giving support to the quantity theory of money. The Banking School position was that the situation was more complicated in that bank deposits were involved. However, the picture is muddied by the relatively simple money demand equations that exist. (In many models, there is no term that forces a demand for money, and so the models predict zero money holdings when interest rates are positive. In such a model, the money supply is obviously endogenous, since the central bank has no means whatsoever to change its level.) From a mathematical perspective, there exists an invertible function that relates interest rates to the money supply. Therefore, we can specify a “reaction function” for the central bank either as a rule on interest rates or as rule on money supply growth. As a result, using those models, one could argue either way regarding whether the money supply is endogenous. The issue is what happens when some extra complexities are introduced into the model, which would break the symmetry between specifying monetary policy in terms of interest rates or the level of the money stock. As my discussion notes, the analysis of how the various instruments are used within the economy in the real world breaks that symmetry. There is a large literature on how money supply targeting worked in practice. However, I was unable to find a modern reference that greatly differs from my characterisation above: the central bank set the interest rate so that money growth would be near some target level. Simplifying somewhat, but without misrepresenting the essence of the case: a money-demand function was estimated using monthly data; values of its real income and price level arguments over a rather short policy horizon were forecast and plugged in, along with the lagged values dictated by the econometrics of an equation based on monthly data; a target value for the money supply became the equation’s left-hand-side variable; the resulting expression was solved for the value of the interest rate that would set money demand moving towards that target value over some desired time horizon; and the Bank then set its interest rate instrument at that value. In light of this evidence, the widely held view that money-growth targeting was a failure is a little too pat. This is not to deny that genuine problems of interpreting the behaviour of M1, the aggregate on which the experiment focused, arose during the course of money-growth targeting, particularly from late 1979 onwards, or that these problems raised important doubts, still relevant today, about the usefulness of monetary aggregates as policy guides. It is, however, to question the common interpretation of this earlier episode, namely that it demonstrates a degree of inherent unreliability in these variables that should disqualify them from anything but a subordinate position in policy formation. I admit to a bias against the use of monetary aggregates in analysis, but I have no strong reason to believe that they are useless. Like other credit aggregates, they should provide some information about the evolution of the economy; however, the behaviour is dependent upon the current institutional framework. In other words, the usefulness of monetary aggregates in analysis is an empirical question. The debate between endogenous and exogenous money is one that would have been resolved a long time ago if economic theory did not assume the existence of some magical entity called “money” within its models, and instead confined itself to the analysis of the instruments that appear in the real world. Although the historical debate covered more territory than I discuss here, the most interesting part can be dealt with by accepting that the central bank sets the rate of interest, and the “money supply” is determined by the reaction of the private sector to macroeconomic developments. Post-Keynesian Economics: New Foundations, Marc Lavoie, Edward Elgar Publishing Limited, 2014. ISBN 978-1-78347-582-7. The section referred to is found on pages 182-183. Purists who think in terms of continuous time economic models would object that this would only be true for price level targeting, and not inflation targeting. However, in the real world, the inflation rate is defined relative to the fixed level from a year before, and so inflation targeting is equivalent to price level targeting in the near run. Page 184 of Post-Keynesian Economics: New Foundations, Marc Lavoie, Edward Elgar Publishing Limited, 2014. ISBN 978-1-78347-582-7. Brian, if you haven't seen this yet. Thanks; I tweeted the link earlier, and left a comment there. I do not think the New Keynesian models make sense, but I am not too unhappy with how they deal with money. So I do not know what to think about Nick Rowe's points. Brian, I found this Reserve Maintenance Manual to be very helpful. It explains how the Federal Reserve determines reserve requirements. The mechanics of reserves makes me think that our banking system of private banks is more illusion than independent reality. After reading the manual, it seems to me that "money supply" is controlled by both exogenous and endogenous methods. The fact that "control" is exercised inspires my "illusion" comment. I plan to read your post a third time and probably more. My goal will be to see how your framework fits into the mechanics as described by the manual. where one should note that Treasury securities and liabilities of the central bank both serve as outside "money" under the provided definition. Sometimes the advocates of Modern Monetary Theory refer to the supply of both vertical (outside) and horizontal (inside) financial instruments. The government ability to curb inflation or deflation under some conditions lends to the argument in favor of exogenous "money" while government support for market credit formation under all other conditions lends to the argument for endogenous "money." The inside/outside money distinction is a separate issue. The original debate regarding Monetarism was whether the central bank could set the level of "the" "money supply." (It was unclear what real world monetary aggregate was viewed as the money supply.) The belief was that the reserves multiplier would handle bank money as well; the realisation that financial innovation would wreck that possibility was only clear in retrospect.